Your gift will help animals and people right here on the Big Island. The Hawaii Island Humane Society is the only open-admittance shelter on the Big Island. Every year, more than 14,000 animals come through our shelter doors. Many are infirm, ill-treated, injured, too young or elderly. Some have never known the security of a home, while others have lost the only home they've ever known. We accept any animal, regardless of age, species, condition, circumstance or behavioral issues at all three shelters island wide. Your donation will go a long way to helping us reach our mission right here on the Big Island. In fact, with your gift, we will be able to provide for the 13,000 animals that come through our doors every year, assist our community in spaying/neutering their pets, educate our children on the importance of treating animals humanely and help our animals find their forever homes! BECOME A MONTHLY DONOR: Members of our ALOHA monthly giving program are the foundation of Hawaii Island Humane Society. 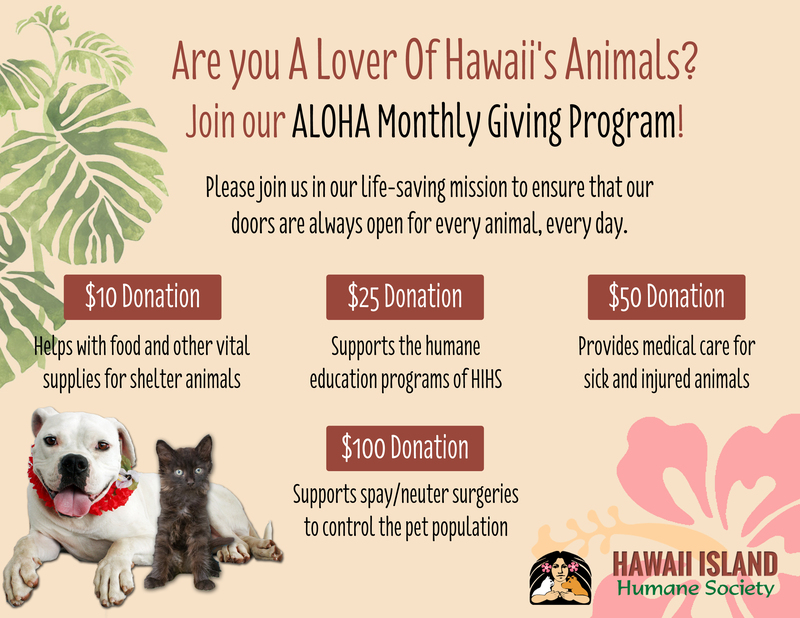 Through monthly donations, ALOHA members provide HIHS with a consistent and reliable source of funding that allows us to plan ahead. 1 yr ago while driving on The Big Island, I learned my beloved dog died and suddenly a rainbow bridge appeared directly over your HS!! It was a sign. Mahalo nui loa for all that you do, from my business and my generous customers. Because despite how punishing it is, I've been witness to how far HIHS has come in their mission over the years and I'm proud of them! Another month, another chance for a good home! Shoutout to Lauren & Pearly for their marketing of the transfer program! Glad you guys are doing this for the Big Island! Aloha. I am donating in honor of Deirdre Britt's birthday. In honour of and thanks to Dr. Casey Milnes and staff at Kona Veterinary who helped us bring our cat Laki back to Canada in 2018.